Selamat Hari Merdeka yang ke 55. I am proud to be a Malaysian. And if I could bake what I feel about this birthplace of my mine, I'd do it. 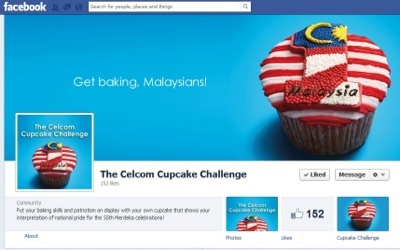 Kudos to Shaz, the Celcom boss, for being creative always. He must love cupcakes a lot. Ngapa HAMBAR je suasana tahun ni,,!!! Why everbody tak kisah nak kibar BENDERA di Rumah,,Kereta dan juga Opis,,,MALU ke!!??? Kan Banyak dapat BENDERA FREE,,!!!! Ngapa ek ASKAR and POLIS tak ikut sama Perbarisan Di Selangor??? Ngapa ek,,,Kali ini Pakaian TRADISIONAL tak nampak pon di DATARAN semasa PERBARISAN,,!!! Ngapa ek,,,Tak ramai PESERTA Perempuan Di Dataran,,yang PAKAI TUDONG,,!!!! Sabahans and Sarawakians will bake on 16 Sept and celebrate since 31 August 1957 is still under British rule. "Here we are united in CELEBRATION. To reach our highest aims, we need to START AFRESH (?CHANGE/ UBAH). To mould a better tomorrow, LET US BEGIN ANEW (? UBAH TO PAKATAN RAKYAT). No,..that's not Pakatan propaganda. It's from PETRONAS Merdeka Advertisement (English version)!! No words to express the love I have for my country, MALAYSIA. East Malaysian only celebrate on 16 Sept cos they were still under British rule on 31 August 1957. Maybe they would celebrate with Kek Lapis or Kong Peah which is more Malaysian. Cup cake is too American. A 55th birthday calls for a lot of cupcakes! My personal favourites are the Red Velvet and the Double Chocolate Chip versions. The Edge did a good write up on young Malaysians who have studied overseas and who have chosen to return to Malaysia to "try and make a difference". Hopefully their youthful enthusiasm will not be doused by the winds of racial and religious intolerance and bigotry in all it's forms. I hate MCA, I hate MIC and most of all I hate the corrupted evil UMNO, robber of rakyat malaysia. I will make D24 cup cakes for you to eat...best. Not so Happy Merdeka his year la...too many dirty politics surrounding the country....all created by Najib. mcm kau sorang je dlm dunia ni yg pandai dan bersih sangat. I hate DAP racist, corrupted and arrogant party. I hate DAP instigating 13th May according to mageran's report. I hate DAP because they would rather die than having a simple islamic state. This country is doing good but not great..We have average leaders but not great leaders..
Singapore was kicked out in 1965 and now is the richest country in the world with no natural resources.Call me kiasu or tulan but I cant accept a country kicked out by us and doing better. Sabah and Sarawak must be cursing their forefathers for joining Malaysia because they dont even have proper roads after 50 years of Merdeka for all their natural resources and riches. But I am still proud to be Malaysian. We just need great leaders that will develop and enrich our country and not their kins,cronies and their own pockets.